Enrollment surged by 2 percent to reach a record 34.4 million people, or one in nine Americans, in the latest month for which figures are available. It was the sixth month in a row that enrollment set a record. Every state recorded a gain, and Florida had the largest increase at 4.2 percent. 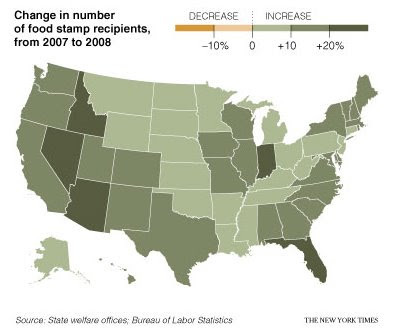 Enrollment for food stamps, which help people buy groceries, is highest during times of economic stress. The U.S. unemployment rate of 9.5 percent is the highest in 26 years. People are hurting these days. Articles like this are a bit of a reality check for many of us.. and a call to prayer and action. Ann Curry just reported on Twitter: "247,000 people lost jobs in July, down from 443,000 in June. Unemployment was 9.5 percent, now 9.4 percent." I just moved to Florida, and I'll confirm. Things are hurting bad down here. FL really is lagging the country in turning around, and the outlook is not expected to improve any time soon. I think most of us know folks that are out of work.. really rough job market these days. Why do we love Insurance Execs?